Follistatin is a single-chain glycosylated protein that inhibits follicle stimulating hormone (FSH) release. Alternative splicing of Follistatin mRNA yields two isoforms, FS315 and FS288. FS288 is the main cell-surface form and binds to surface heparin sulphate proteoglycans. 29/9 is a clone raised against recombinant Fst 288, and is used in combination, commonly as the capture, with antibody 17/2 in a two site ELISA for the detection of Follistatin. 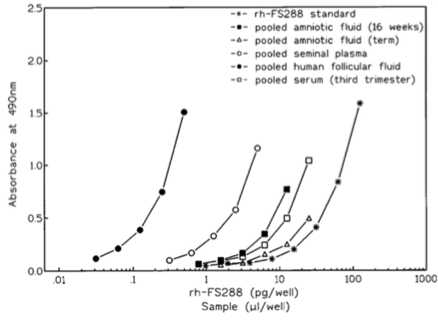 Specificity: Raised to human Follistatin (Fst) 288 and recognizes both human Fst 288 and 315. 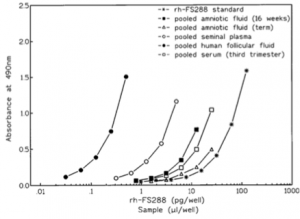 Evans, L. “Development, Validation and Application of an Ultra-sensitive Two-site Enzyme Immunoassay for Human Follistatin.” Journal of Endocrinology 156.2 (1998): 275-82. Hughes, Robin D., and Lee W. Evans. 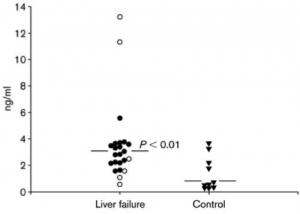 “Activin A and Follistatin in Acute Liver Failure.” European Journal of Gastroenterology & Hepatology 15.2 (2003): 127-31. D’antona, D. “Increased Maternal Serum Activin A but Not Follistatin Levels in Pregnant Women with Hypertensive Disorders.” Journal of Endocrinology 165.1 (2000): 157-62. Anderson, R. A., L. W. Evans, D. S. Irvine, M. A. Mcintyre, N. P. Groome, and S. C. Riley. “Follistatin and Activin A Production by the Male Reproductive Tract.” Human Reproduction 13.12 (1998): 3319-325. Yuen, M.-F., S. Norris, L. W. Evans, P. G. Langley, and R. D. Hughes. “Transforming Growth Factor-Beta 1, Activin and Follistatin in Patients with Hepatocellular Carcinoma and Patients with Alcoholic Cirrhosis.” Scandinavian Journal of Gastroenterology 37.2 (2002): 233-38. Menon, U., Riley, S. C., Thomas, J., Bose, C., Dawnay, A., Evans, L. W., Groome, N. P. and Jacobs, I. J. (2000), Serum inhibin, activin and follistatin in postmenopausal women with epithelial ovarian carcinoma. 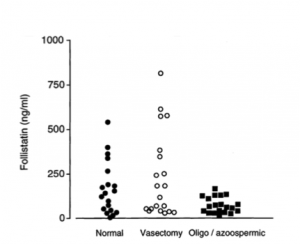 BJOG: An International Journal of Obstetrics & Gynaecology, 107: 1069–1074. Cuckle, H. S., I. Sehmi, R. Jones, and L. W. Evans. “Maternal Serum Activin A and Follistatin Levels in Pregnancies with Down Syndrome.” Prenatal Diagnosis 19.6 (1999): 513-16. Fowler, P. A., L. W. Evans, N. P. Groome, A. Templeton, and P. G. Knight. 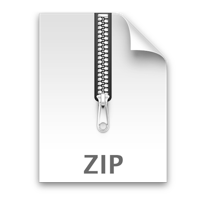 “A Longitudinal Study of Maternal Serum Inhibin-A, Inhibin-B, Activin-A, Activin-AB, Pro-alphaC and Follistatin during Pregnancy.” Human Reproduction 13.12 (1998): 3530-536. Riley, S. C., C. Balfour, N. C. Wathen, T. Chard, L. W. Evans, N. P. Groome, and E. M. Wallace. “Follistatin and Activin A in Extra-embryonic Coelomic and Amniotic Fluids and Maternal Serum in Early Pregnancy.” Human Reproduction 13.9 (1998): 2624-628.